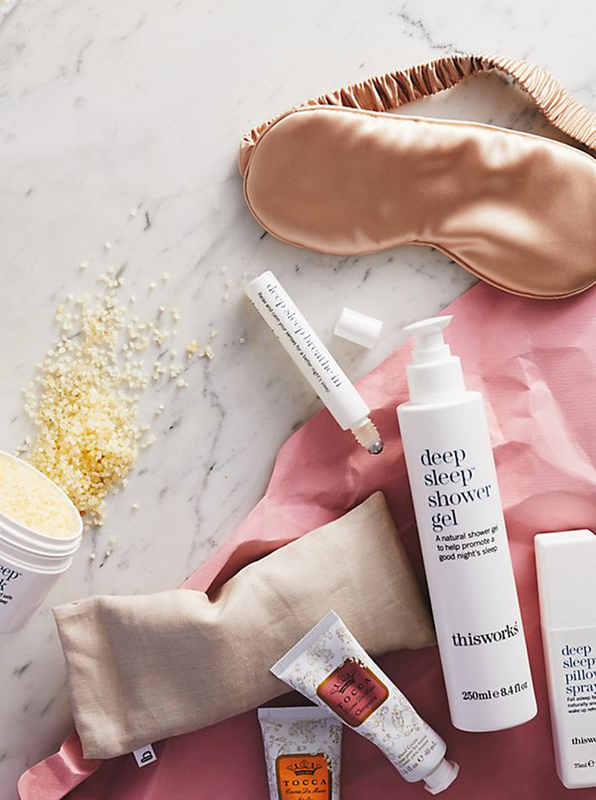 Alright friends, listen up— when it comes to your beauty routine, very few things are free; that is, except for sleep. It costs nothing and may be the closest thing we have to a legitimate fountain of youth, yet most of us aren't getting nearly enough (*cough cough* me). In fact, a 2017 study found that only two days of sleep restriction negatively affected a participant's perceived attractiveness and overall health, amongst other detriments. Dr. Shah, an American, Board-Certified plastic surgeon explains that "Your body repairs itself and recovers while you sleep, and that results in a long list of benefits for anti-aging and appearance." And since most experts agree that seven to nine hours per night is ideal, I think it's time we all started prioritizing getting some shut eye. That said, here are six expert tips for maximizing your beauty sleep... nightie night! "Sleeping on your stomach or on of your sides means there is constant pressure on your face," Shah says. "Over time, this action will produce unwanted sleep lines." Yuck. The solution? You guessed it, sleeping on your back. This may feel uncomfortable at first, and although you certainly can't control your involuntary sleep movements, you can practice and get used to sleeping on your back over time... Worth it. Washing your face can dry it out, as can the act of sleeping itself, especially if you snooze in a low-humidity environment (guilty). While staying hydrated by drinking water can help to some extent— especially when you first wake-up in the morning— what your skin really needs while it's repairing itself at night is good skincare. For a more supercharged product, try an overnight mask such as Youth To The People's Superberry Hydrate + Glow Dream Mask, Glow Recipe's Watermelon Glow Sleeping Mask, or my personal favourite, Image Skincare's Ageless Total Overnight Retinol Mask. All are great options for waking up looking glowing and refreshed, but go for whatever product you prefer. Another brand of products/anti-aging supplements I'm curious about exploring is Jeunesse, so if you have any recommendations from their product roster, I'm all ears! While facial creasing has a lot to do with sleep positioning (see tip No. 1), swapping your cotton pillowcase in favour of a silk one can go a long way towards reducing unnecessary lines. "There are numerous benefits of silk for good sleep," Shah says. "The smooth texture of silk is gentler than cotton and may help prevent sleep wrinkles, as well as reduce skin irritation. Its tightly-woven fibres also don't draw out moisture and natural oils as cotton does, leaving your skin better hydrated." As if we needed another reason to justify our Slip pillowcase addictions, ammiright? If you're craving a midnight snack or drink, be mindful. While some foods— like crackers or an apple— can actually help you sleep, many others disrupt your rest and wreak havoc on your appearance. I'm looking at you, salt and alcohol. These items are super dehydrating, so to compensate, your poor body will start collecting natural fluids around the eyes (amongst other places), leading to that dreaded, puffy-eyed look. Fun fact: dehydration is also linked to dark undereye circles, so do yourself a favour and stay hydrated amigos. I'm not referring to a figurative, Rachel Hollis type of face washing; I mean literally, wash your damn face before bed. "No matter how tired you are, going to bed with your makeup on will only [make things] worse the morning after," Shah says, noting fun, sleeping-in-makeup side effects such as clogged pores, irritated eyes, and oily-residue accumulation. But if you're just too tired (or you know, drunk) to make it to the sink, Shah recommends keeping some good-quality cleansing wipes by your bedside at the very least. "It's not ideal to rely on cloths every night in place of a deeper clean, but on late nights they're skin saviours," he says. No excuses, ladies.